NEWS FLASH! Everyone, stay calm, we have great news. New York City has a new mayor. Yep, all your problems are solved. The state? Capital? Both things of the past. Why? Because some goof positioning himself as “progressive” is steering the ship for a while. Unfortunately, sarcasm doesn’t necessarily read well on the internet. If it isn’t clear enough, we in NYC ABC harbor no illusions that the new guy is, to paraphrase The Who, not just like the old guy. So until we hear otherwise, we’ll just keep doing what needs to get done– supporting imprisoned comrades. The most common way we do that is with every-other-week political prisoner letter-writing dinners. This week we are writing to Mumia Abu-Jamal. We’ll also be passing around postcards to sign for grand jury resister Jerry Koch. 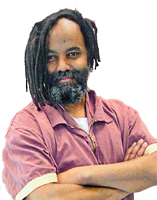 Mumia Abu-Jamal is an African-American writer and journalist, author of six books and hundreds of columns and articles, who has spent the last 30 years on Pennsylvania’s death row and now general population. Mumia was wrongfully convicted and sentenced for the murder of a Philadelphia cop named Daniel Faulkner. The demand for a new trial and freedom is supported by heads of state, nobel laureates, distinguished human rights organizations, scholars, religious leaders, artists, scientists and, as important, millions of folks like you and us.